The Planets by Gustav Holst is a seven-movement orchestral suite composed from 1914 to 1916 and originally performed in 1918 in London. The final movement of the piece, Neptune, incorporates a female choir off-stage towards the end of the movement. While there are nine planets depending on the year, the movement only includes Mars, Venus, Mercury, Jupiter, Saturn, Uranus and Neptune. Pluto had yet to be discovered and was not included. The Planets has a strong astrological base for its movement, revolving around the Earth as the center for the suite. The music composed reflects how Gustav felt and saw the planets and what they represented. For vocalists and choirs, this is a rather difficult piece. Choral director Kelly Miller has been preparing the UCF Women’s Choir for this performance since August. The full performance will begin with Three Village Scenes by Béla Bartók, Blue as the Turquoise Night of Neyshabur by Kayhan Kalhor, and end with Holst’s The Planets. What makes this concert’s selections challenging to perform? Both the Bartok and the Holst are extremely challenging. The Bartok is difficult across the board with a wide range, featuring Slovak, a language we don’t perform very often. It’s the first time I’ve done Slovakian! It’s out of the realm of our standard languages that we use. And, the music itself is quite challenging. Bartok is very chromatic, and it doesn’t go where you think it’s going to go. The Holst has no language at all – it’s this easy, ethereal writing and double chorus that is all on “ah.” The Holst is challenging in that it’s a high tessitura, or where the average range of the voice lies, it just hangs very high for a long period of time. I think what is so impressive is the difficulty, especially the Bartok. It is by far the most challenging piece I have ever worked on. But this choir doesn’t think twice about it. You expect outstanding things and they say, “Okay, that’s great.” I’m always overwhelmed at what they’re willing to do. They just keep picking up things. You set the bar at one level and they just surpass it every time. What is the most challenging aspect of preparing for The Planets? The majority of students in this choir aren’t music majors. This happens to be incredibly challenging literature being played in combination with the Philharmonic. I prepare the choir and I know what they need as far as gesture and conducting, and also help them anticipate Maestro Jacobson and the Orlando Philharmonic. Maestro Jacobson has an entire orchestra that he’s got to keep together. They’re in this group because they love to sing, and they’re just given this wonderful opportunity. 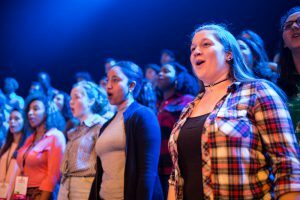 We hope that with a campus with a student population as large, more people will hear about the choir and the wonderful things we’re doing and want to be a part of it. And realize they don’t need to be a music major to be a part of these incredible experiences. The UCF Women’s Chorus will perform with the Orlando Philharmonic on Saturday, November 3 at 8 p.m. in the Bob Carr Performing Arts Centre. For more information and to purchase tickets, visit orlandophil.org.